The name of this condition that results in easy and frequent motion sickness is the Neuro-Ocular Vestibular Dysfunction (NOVD) or the See-Sick Syndrome (SSS). To understand how motion sickness is related to visual dysfunction, one must look at the neurology of the brain that deals with providing stability and normalcy to our lives. The part of the brain that allows us to have a sense of balance and calm even when the visual space world from our eyes plus the movement of our body, influenced by the forces of gravity and objects within our environment is called the Vestibular System. Just as the eyes are the sensory receptors for vision, within the middle ear are the “peripheral sensory receptors” including the semi circular canals (SCC) and the otolyth organs (utricle and saccule) which responds to our body’s vertical, horizontal and rotational movements. The beauty of the vestibular system goes beyond the sensory receptor within the middle ear. The beauty is the central processing within the variety of other sensory systems within the brain that provides normalcy to our world so that we know up from down, our sense of where we are in space and which way we are going. One way to think about it is that the vestibular system is the neural software that helps us to keep us from “getting lost in space”. Yes the vestibular system is closely integrated with tactile (touch), proprioception (sense of movement), auditory (hearing), kinesthesia (muscle awareness) and vision. Indeed in order for us to have a sense of balance and stability the “neural software” of the vestibular system must effectively integrate with of these sensory systems and especially the dominant sensory system -VISION! The problem with visual-vestibular integration typically begins in these patients with an associated binocular (eye teaming), accommodative (eye focussing), oculomotor (visual tracking) and/or visual perceptual problem. The visual condition alone may not be severe enough to result in overt visual symptoms but just enough to provide interference for the patient in their visual-vestibular connection. As a result they become symptomatic with the activities that have a visually stimulating central and peripheral vision component. Examples of reading while riding in a moving car, watching an action movie or especially 3-D movie on a big screen, moving through a big supermarket with attention on details but processing peripherally all the displayed items simultaneously. All are examples of how a fragile visual function coupled with ineffective integration with the “neural-normalcy software” (vestibular system) results in the classic motion sickness symptoms for the patient even though they are not engaged in anything that would cause a problem to most people. The good news for patients diagnosed with the See-Sick Syndrome is that there is an effective treatment solution. This usually involves a combination of properly prescribed ophthalmic lenses as well as office-based optometric vision therapy along with some home-oriented activities. The duration of treatment is dependent on a variety of factors but when the patient is consistent with their prescribed doctor supervised treatment plan it routinely takes less than 3 months. The end result is problem solved and the patient can enjoy life without coping strategies; a life long resolution of the condition and no more easy motion sickness! 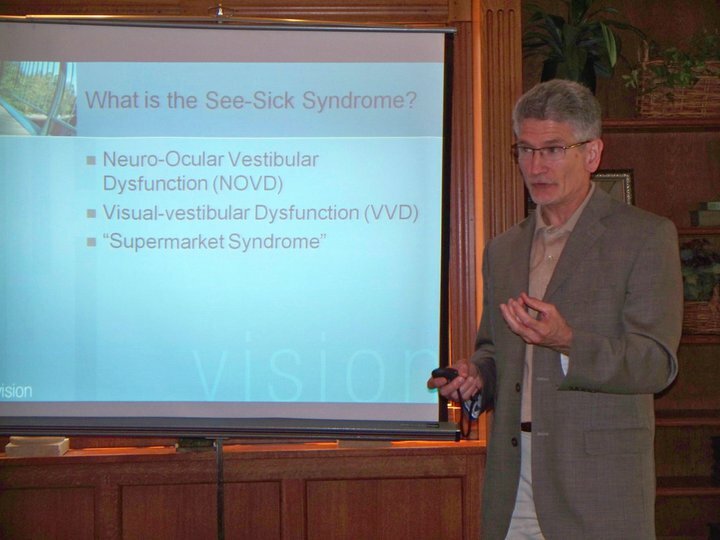 Share the post "The See-Sick Syndrome…when visual dysfunction causes motion sickness"
Previous PostAccommodation’s 3-A’s…The Triple Play for Reading and LearningNext PostWhat Can Vision Therapy do for You?